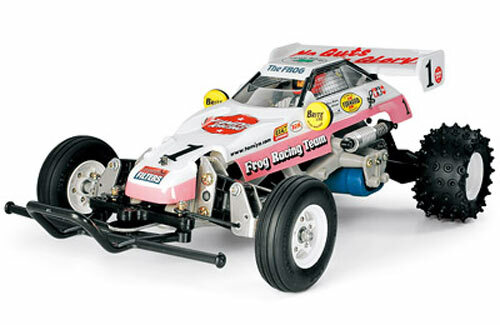 All Products > "58354 Tamiya 1/10 Frog 2WD Buggy Ltd. Ed"
First introduced in 1983, the 2WD racing buggy Frog made a huge splash with its eye-catching design and high performance running. The Frog now makes a comeback, updated for a new age, but with its basic structure essentially unchanged. Preserving its characteristic space frame, the oil dampers for trailing-arm type rear suspension have been updated to diaphragm type. Rear drive shaft features dogbone type joint for secure power transmission. Sleek polycarbonate body remains the same, while 3-piece wheels feature front grooved and rear spike tyres for excellent off-road running. • Includes re-designed side aluminum dampers inspired by TRF shock design. • Includes re-designed dog-bone style drive train with original rubber boots. • Reintroducing the original 2WD buggy masterpiece featuring ABS resin space frame, horizontally mounted oil dampers, inboard spring type front suspension. • Powered by a Type 540 motor. • Kit includes straight ribbed racing front tyres and high-grip rear spiked tyres. • Wheels are realistic 3-piece type.